Multi-gate out sequencer where you can freely define the order of the "cells" (= seq steps). [CV-Out bi]: outputs sync bipolar control signal. connect it with a Flexor seq module RampIn if you like. [CV-Out uni]: outputs sync unipolar control signal. Text Boxes 1-15 [1-16]: defines the next seq step after the current step is played. Text Boxes 16 [1-16;Rand]: defines the next seq step after the current step is played. by choosing [Rand], random seqences can be achieved. All gate sequencer modules here. look here how to use this module in sequencer patches. GateSeq2 has step-hold buttons. To use this feature, GateOut must be connected to an ADSR envelope. Length control + LengthMod control. as above; new Pattern management. sync seq module which outputs gate messages. 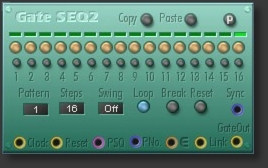 additional feature: length controls for each step (for ADSR EGs). Up to 128 pattern can be stored/recalled, also by MIDI.